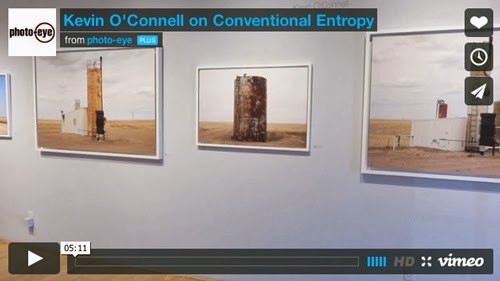 Video Kevin O'Connell on Conventional Entropy Photographer Kevin O'Connell discusses his exhibition Conventional Entropy currently on view at photo-eye Gallery in Santa Fe, NM. Photographer Kevin O'Connell discusses his exhibition Conventional Entropy currently on view at photo-eye Gallery in Santa Fe, NM. O’Connell’s photographs depict pipelines, pumps, tanks and towers used to extract energy from the natural landscape. However, the machines succumb to the natural world and the massive structures stand as monuments to entropy itself. O’Connell explores the topic of energy development and consumption and the proliferation of these machines unable to withstand the test of time. The exhibition continues through April 5th, 2014.